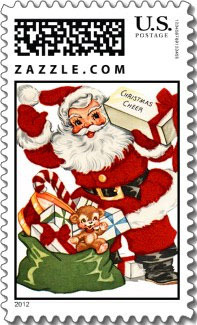 Every Santa Claus Christmas Postage Stamp is available in three sizes and all denominations. 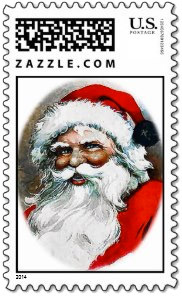 Click on any Santa Claus Stamp for a closer look. Vintage Santa Claus touching his nose as a message to children everywhere. The text "A Merry christmas to All" in a banner near the bottom. 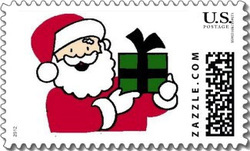 A colorful and sharp Santa Christmas stamp. A rare victorian image Sante Claus. 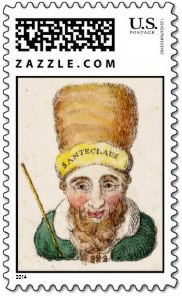 A vintage European Santa Claus Christmas stamp. Classic Santa Claus image with a big smile, sooty cheeks and hat. 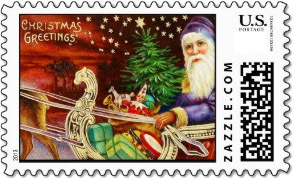 Sharp and colorful Christmas stamp. This vintage Santa Claus is walking with his cane and his bag full of gifts. 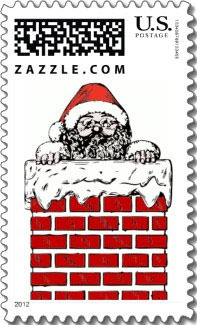 A fun Santa stamp. Santa's sleigh and eight reindeer fly through the night sky as Santa waves good night. 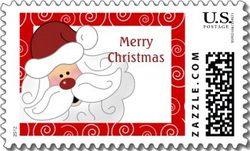 Colorful red, green and blue Christmas stamp. 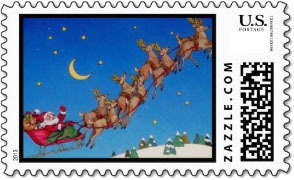 A young girl and Santa Claus fly through the night on an old time rocket on this vintage Christmas stamp. 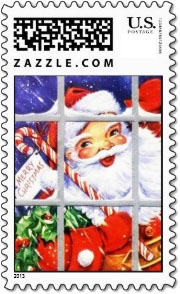 This classic vintage Christmas postage stamp has a smiling Santa Claus at the window with his bag of toys. 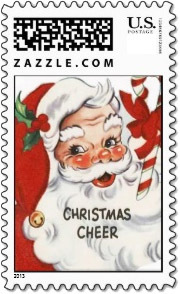 A rosy cheeked Santa fills the frame of this vintage Christmas stamp. 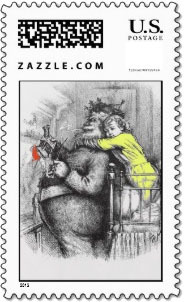 Santa is "caught" in a hug by a little girl while he is delivering gifts on this vintage Santa Claus stamp. 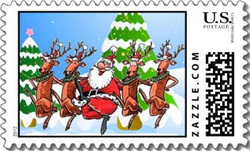 Fun and little bit crazy, this Santa Claus postage stamp has Santa dancing the Can Can with his reindeer around several snowy Christmas trees. 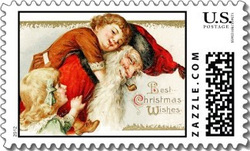 A beautiful vintage Christmas stamp showing Santa getting big hugs from two children. Included text offers "Best Christmas Wishes". This modern and stylized painting of the jolly old elf with his yellow toy bag is the perfect Christmas postage for any modern Christmas card. 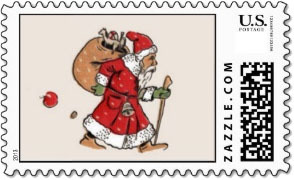 This Christmas stamp has a portrait of the classic Santa Claus we all know and love in his red outfit and long white beard. This vintage Santa is delivering a box of Christmas cheer along with his toys. 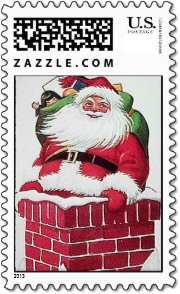 A popular Santa Christmas stamps. 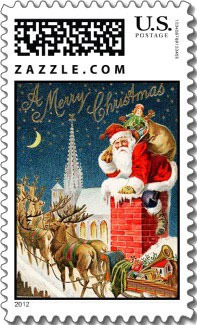 This vintage Christmas stamp is a colorful rooftop scene of old St. Nick going down the chimney while his reindeer wait. 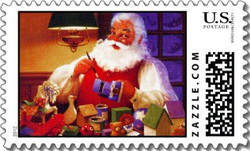 A colorful vintage Christmas stamp with a jolly Santa at his workbench putting the finishing touches on Christmas toys. 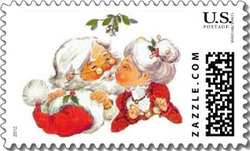 One of the sweetest Christmas stamps has Santa and Mrs. Claus kissing under the mistletoe. Vintage Santa Claus in his sleigh with a bag of toys and the text "A Merry Xmas". 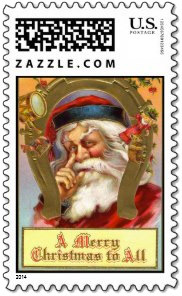 Fun Santa Claus Postage Stamp. For retro Christmas cards this vintage Santa with his cane and bag of toys is a wonderful Christmas postage choice. 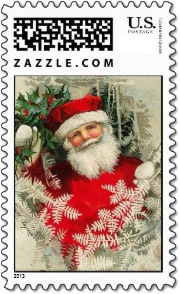 This child's eye view of Santa Claus' belly and belt is a simple and fun Christmas stamp that goes well with any Christmas card motif. 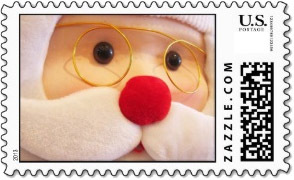 This cute sooty Santa Christmas stamp is just the one to get a Christmas chuckle from those on your list. 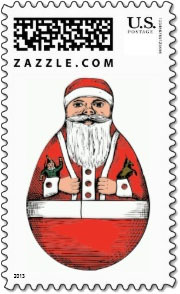 A simple and popular Christmas stamp with a smiling modern red suited Santa delivers a Christmas present. For more of a designer look, choose this cute and swirly Santa Claus Christmas stamp framed in red with the words "Merry Christmas". 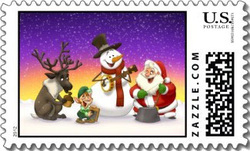 The Santa Claus jug band Christmas stamp includes a snowman, elf and reindeer knocking out fun Christmas tunes. 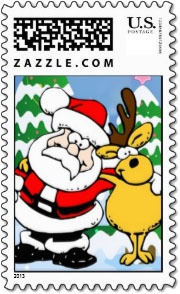 Christmas buddies Santa and his reindeer have their arms around each others shoulders on this colorful Christmas stamp. 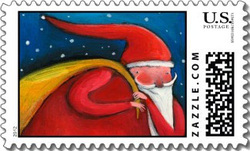 A fun roll polly Santa fills this unframed Christmas stamp. This vintage Christmas stamp has a long bearded Santa Claus with the text I Wish You a Merry Christmas in a Victorian font. 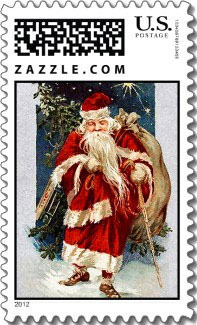 A wonderful Santa stamp for any Christmas card motif. A big bright close-up photograph of a plush Santa claus doll. 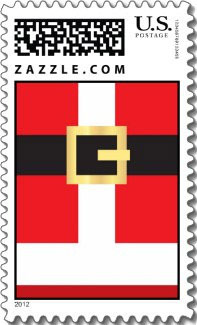 A very huggable Christmas stamp. 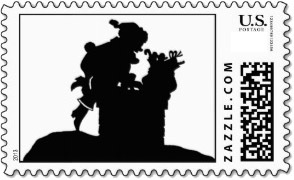 There is no mistaking this black and white silhouette on this Christmas stamp . . . Santa going down the chimney with his bag of toys. 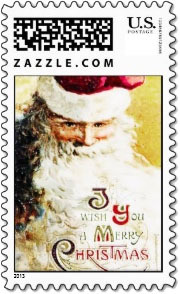 This vintage Santa Claus stamp has Santa in his sleigh dressed in purple and wishing you Christmas Greetings. A vintage image of a rosy cheeked Santa wishing you Christmas cheer. 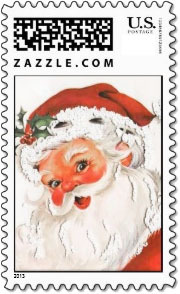 A popular Santa Claus Christmas Stamp. This vintage Christmas stamp shows Santa among frosted Christmas trees with a handful of holly. A fine vintage rendering of the jolly old elf.